Ticket handed out at the St. Paul Maturaball 2007. With this ticket a visitor will get 25% discount for the entrance. 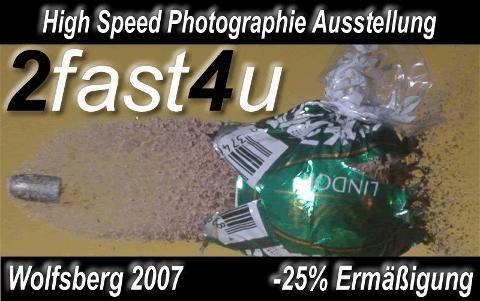 The project 2fast4u is evolving with time and is now a project between three schools: the Massachussetts Institutue of Technology (MIT), the Stiftsgymnasium St. Paul and the HTL Wolfsberg. The exhbition will not only show High Speed photographs taken at the MIT in Cambridge, Massachussetts, but also show objects and high speed experiments built by students from St. Paul and Wolfsberg. The schools and students are excited about the project and are looking forward to present their photographs and results in April 2007 in the Kuss Wolfsberg.